Sew a toy for your child by yourselfDifficult, as it seems. If you know how to hold a needle and feel a creative impulse - get down to work, especially since for kids great joy will be new fun. Toys for children with their own hands are made of fabricsJuicy colors, with a bright print or monochrome. Suitable cotton, cotton, linen, felt, burlap, fleece and artificial fur - these materials are easily processed slice, and they have a nice texture, developing tactile sensations. As the most simple filler suitable for ordinary cotton wool, but it is better to stock up with sewing batting, sintepon (sometimes foam can emit harmful substances, it is better not to take risks). There is a special filler in the balls ofSilicone, very pleasant to the touch, with a massage and soothing effect, but it has two drawbacks - a high price and a ban on use in toys for children under 5 years old. A simple toy for babies with your own hands is obtained from calico fabric, it can be done quickly, and you will not need special dressmaker skills. Needle, thread, scissors, paint brush. Start with the fact that draw the shape of the future dolls on thick paper - this will be a pattern of the toy. Fold pieces of different chintz so that the top third of the pattern falls on red cotton - where there will be a head "In a kerchief". Gap in the places of convergence of the tissues, leave 2 cm. Mark the contour of the doll on the folded fabric, cut it with sharp scissors, leaving allowances for seams of 1 cm. Sew a simple seam first with a red cloth with a cotton print, then lay small seams along the contour of the doll. Turn out the shape and fill it with filler, sew it with a hidden bottom seam. Cut out a piece of beige cloth round face,Glue it in place and paint the bangs, eyes, eyebrows, ruddy cheeks and a neat mouth. Place two dots in place of the spout. The classic face of the Russian doll is ready! 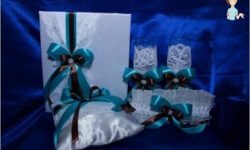 A seam connecting "Handkerchief"And"dress"You can leave it as it is, but you can decorate with a thread of beads or a ribbon. Connect to the process of the child, and you both getGreat pleasure, and the resulting thing will remind you of joyful minutes for more than one year. 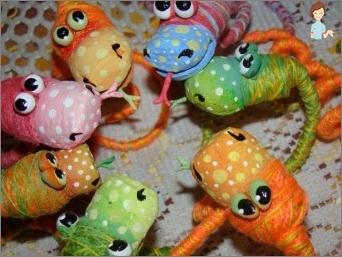 Particularly touching are the first fruits of joint creativity - soft toys, sewn by the hands of children. Control that the child safely uses sharp objects. We will sew a funny bright python! Cut first two circles of contrasting color of fleece fabric - the idea is to make the belly and back of different shades, the back is better yellow or green, like a real python. From a bright red fabric, we cut out a forked tongue, sew it into "Head"With a few neat stitches. Further we sew with a tambour seam "body"Snakes to the tip"Tail". As the seam progresses, we do not forget to stuff a toy, because because of the elongated shape, then it will be difficult to do this. Sewing the narrowing "tail". Sew the buttons on the spot "Peephole". We begin to decorate: you need to cut from multicolored pieces of stripes or circles - future "Specks". We sew them in small artillery or simple seam in artistic disorder by "Backrest"Of our python. The toy is ready, as you can see, you can do it not in one day - in an hour! 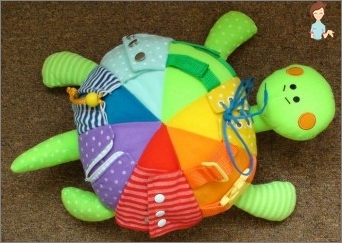 An excellent soft toy for the baby with his own hands is obtained in the form of a round pillow - you can play, and you can take a nap, putting your head on it or hugging you. 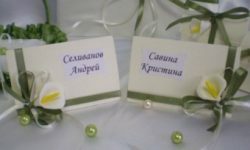 Cut out two circles of artificial furDiameter, what you conceive a small pillow - it can be a small pillow-toy or a full-fledged baby pillow. On the contour of one of the circles on the front side, sew simple stitches with pieces of bright ribbons folded in half. At the same time, position them with the eyelet closer to the center of the circle. Sew both halves face downA strong seam, leaving a gap in order to enclose the filler. Turn out the cover of the pillow and fill it with a sintepon rather tightly, then close the hole with a hidden seam. Fur is better to choose a short, so it was convenientTo expand the muzzle of a lion. In place of the eyes, make a few stitches with green threads, a contour with cilia and eyebrows should be crocheted with brown. Embroider a brown and triangular nose and "Cat smile"With a mustache - long beautiful stitches. Everything is very simple! 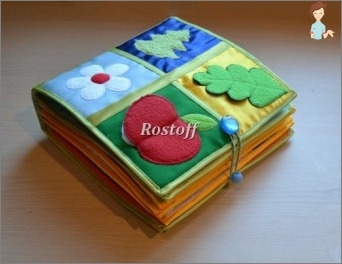 To develop a child, we need interestingToys that can be made from cloth with simple patterns. 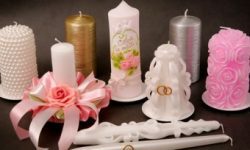 The latter can be taken from the Internet or invented independently, because the baby is 2-3 years old, but at this age such handicrafts are most needed, unpretentious to the form. The main thing is to make everything neat and choose a bright cloth. What ideas will work? Good will be soft letters and numbers, because to learn the ABC child is easier in the form of a game. The secret is to make the letters of a pleasant to the touch fabric, large (about 10 cm high), multi-colored. To decorate the alphabet with something special is not necessary, it is better to sew letters along the contour with a tambour seam - this is both neat and durable. You can also make a rug from fleece, sewing it on a scrappy technique - from multi-colored squares. Each color of the square corresponds to a soft figure of the same color. These self-made lotto developing well teach shades and develop an analogy in children 1-2 years old. As a simple figure, a soft carrot on a sintepon or cotton wool, a mushroom, an apple, a ball and a cube. The scope for creativity in making children's toys is great, do not be afraid to start sewing for your child, even if you have not tried it before. It's fun and can be your hobby.